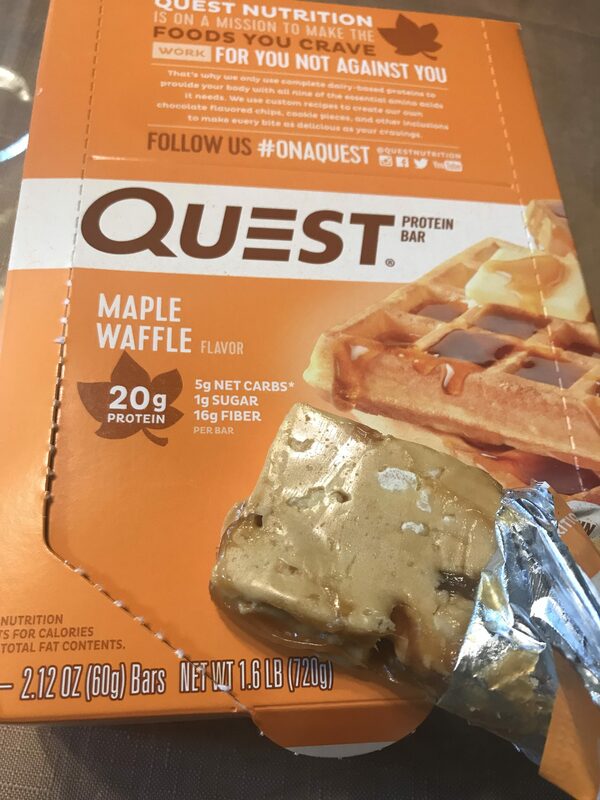 Anyway, recently Quest dropped the Maple Waffle protein bar. As a caveat…maple is one of my *FAVORITE* flavors. Maple syrup on waffles, pancakes, eggs, toast, bacon…you name it, I like it. So needless to say I was pretty pumped about this. Here’s what it looks like. And yes, just as Maple syrup would promise, it is sticky. Yes, very sticky. You will need a napkin. It will stick to the wrapper. This is not microwaved! The taste is very similar to their Vanilla Almond bar, in fact, I think vanilla and almond is more of predominant flavor than maple. 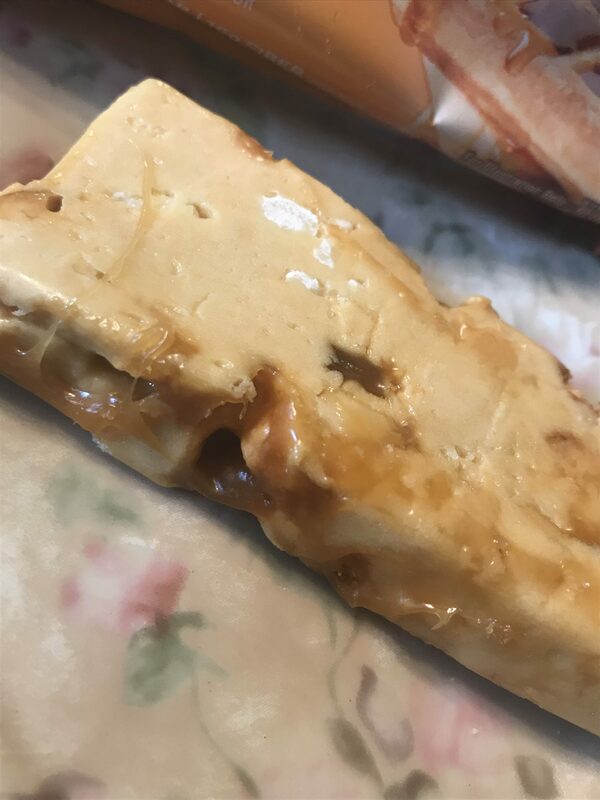 However, it does have a maple aftertaste, but it is overwhelming with that artificial sweetener flavor when you bite into a “gooey” maple syrup spot of the bar. There are little crunchy bits scattered throughout the bar which are yummy, which give it a toasted waffle appeal, and add additional sweetness. The bar is dense and chewy like their traditional style, but the stickiness of the scattered maple syrup really makes it, well, annoying to eat. Stuck to the wrapper, sticks to your fingers, stuck on my plate. Overall, I am underwhelmed by this flavor. I’m sad I bought a box actually, because this is not my go to bar. I tried it twice, and both times was not a huge fan. It is just overly sweet, but that “fake sweet”, and it lacks some sort of counterbalance, such as the buttery flavor from waffles, etc. I know this is hard to capture in a bar, but would I buy it again? No. Would I eat it again? Yeah. 1 bar is 190 calories, 6 grams of fat (2.5 saturated), 290 mg sodium, 24 g of carbohydrate, 16 grams of fiber, 1 gram of sugar, and 20 grams of protein. 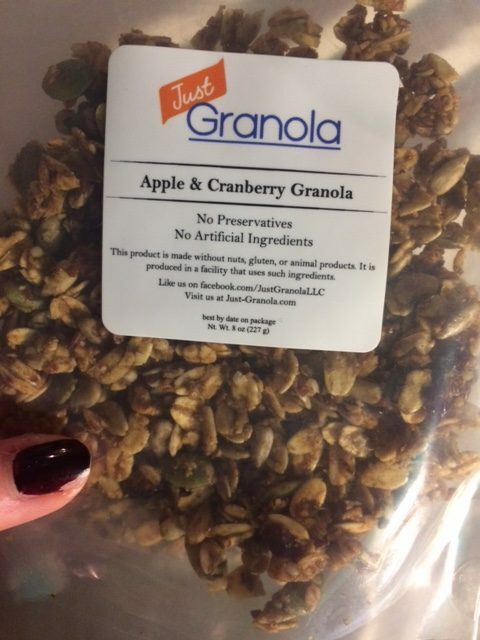 Today we are reviewing one of my favorite things… granola. 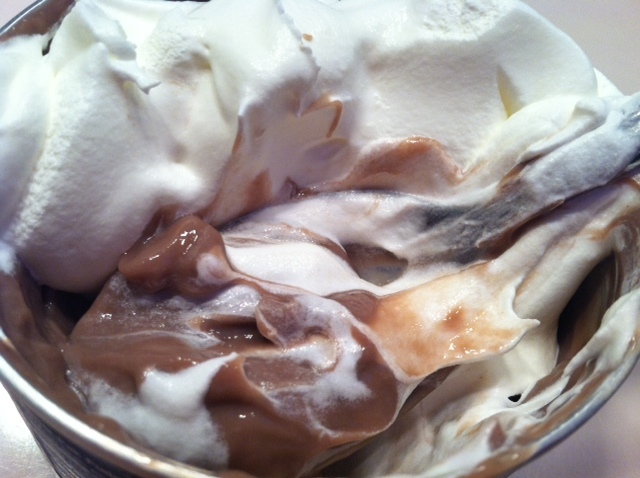 In yogurt, out of the box, in bar form, UGH LOVE IT. I could eat it all day. I won’t…because it’s usually loaded with sugar…but here’s hopes to Just Granola filling the void for granola, that is both healthy and nutritious. Note: If after this review you decide you want to try some, you can head over to the website and first time customers get 20% off with code “launch20”. First up, the Peanut Butter Granola bar. BOY WAS I PUMPED FOR THIS. Healthnuttxo fans will know…by now…hopefully…that I am a nut butter addict. So now combine my favorite food (spread? I mean it’s technically peanuts…) with granola?!?! Let’s get to it. NOTE: THIS BAR CONTAINS PEANUTS, WHEAT/GLUTEN. It was a Chewy and dense bar, little bit of cinnamon flavor to it. Did not taste much peanut butter to it to be honest, which is sort of disappointing for a peanut butter granola bar. It tasted more “oat-y” and “cinnamon-y” than “peanut butter-y”. I just made those words up so…follow along! 🙂 It wasn’t *bad*, it just wasn’t exactly my favorite. A bit on the bland side, and really not enough of a peanut butter punch that I need in order to be satisfied with a peanut butter product. 2 1/2 stars. 1 bar is 3 servings (which is SUPER easy to eat when it looks like a cookie!) 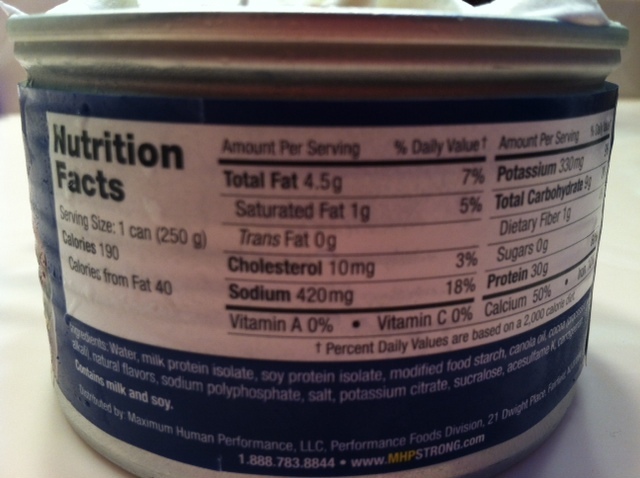 at 130 calories, 6 grams of fat, 16 carbs, 2 grams fiber, 6 sugars and 4 grams of protein. Next up, the Oat & Raisin Granola Bar. I liked this one better than the peanut butter bar. It was chewy, and again, had a nice cinnamon flavor. It wasn’t too sweet, but with the raisins gave off an oatmeal raisin cookie type of feel. It was soft, but had like a very “toasted” almost slightly “burnt” flavor to it that was predominant. However, not bad. 3 stars. Lastly, the oh so delicious, Apple & Cranberry Granola. I had just a tiny bit of this after having my wisdom teeth taken out and LET ME TELL YOU, it was such a tease, because after an extraction you are not supposed to have any foods that may “get stuck” so I had to patiently wait until I was fully healed to enjoy the rest of the bag! The cinnamon flavor (again) is strong but really works here. It was a sweet and “soft” granola, as in, not crispy./crunchy which I guess is due to not using tons of oil. It had a nice honey flavor as well, and sweetness was provided from bits of dried apple and cranberry. I also detected a nice, light brown sugar flavor. 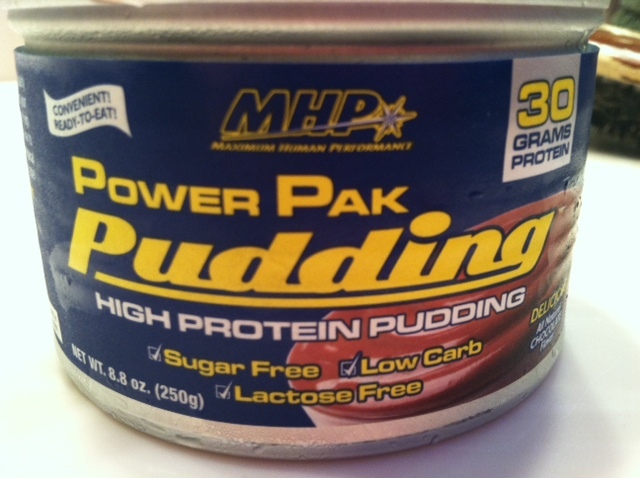 One serving is 100 calories, 3.5 g fat, 15 carbs, 7g sugar and 3 grams of protein. Overall, I think the products are worth a try. 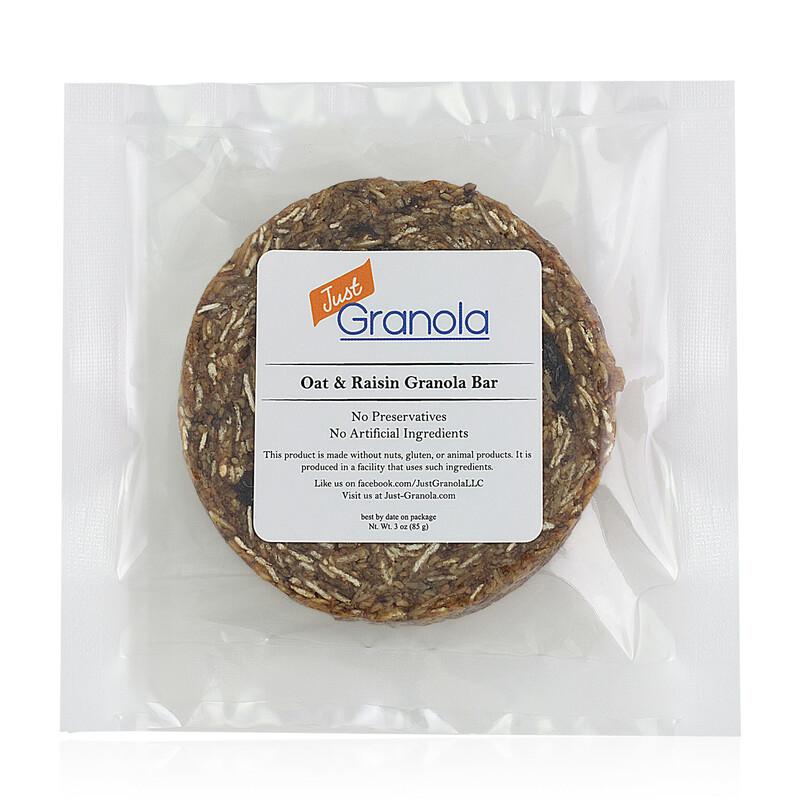 I am a granola fan, and I like the idea behind these products. I also liked that they weren’t overloaded with fat or added sugars. Always a plus in a my book! Note: I received these products for free from the company. This is an UNBIASED review. I got these puffs in both apple and banana flavor, which come in long, plastic tubes with a flip open cap. According to the package the puffs come in, they are made with whole grains, are BPA free, organic, and provide some calcium, vitamin B and D, and iron. These puffs are essentially little pieces of cereal that are easy for the baby to eat. They are also soy, corn and dairy free. As for me, I decided they might be a good munching snack or a good addition to trail mix. They are in cute flower-y shapes, about the size of Cheerios. In fact, these taste pretty much like Cheerio’s as well. THey are light and puffy, and have a pretty bland flavor. They only provide .5 grams of sugar per serving, so I wasn’t really expecting much sweetness. The apple puffs had a very slight granny smith apple aftertaste, and the banana puffs didn’t really have much of a banana flavor, but were just sweeter, rather. Overall, I give these 3 stars. I understand they are meant for babies, so they are low in sugar, but also a bit low in flavor. However, they are GREAT for babies- just like the package says, they really melt in the mouth, so the baby can eat it easily. They are also small and easy to pick up. As for me, I like that they are organic, contain vitamins like calcium, and are pretty low calorie, although they lack fiber. I think they would be great for a little added crunch in yogurt, or to add to “bulk up” some of those sugary cereals for breakfast. 1 serving, 75 pieces/ about 1/2 a cup, is 25 calories, 0 grams of fat, 6 carbohydrates, 0 grams of fiber, .5 grams of sugar, and 1 gram of protein. No Nuttin’ Foods Inc. makes snacks that can be enjoyed by almost everyone, as they made products that are gluten free, nut free, egg free, dairy free, and are also all natural and healthy, too! These snack range from granola bars, to trail mixes, to granola clusters, and come in several yummy flavors. The company sent me a few snacks to try, so I decided to try the Vanilla Caramel Granola Clusters and the Apple Cinnamon Granola Bar. Those sounded most appealing to me. Vanilla Caramel? Count me in. Apple Cinnamon? We all know I love apple anything! Overall, these aren’t bad. They are a good option if you cannot tolerate gluten, and cannot have peanuts or nuts. I liked how the granola clusters and granola bar were low in sugar, but I just didn’t really care for the texture of either too. Also, they are both kind of low in fiber and protein, but if paired with some fruit or yogurt/protein, they could be good snacks. 1 packet of vanilla caramel granola clusters (30 grams) is 130 calories, 5 grams of fat, 19 carbohydrates, 2 grams of fiber, 5 grams of sugar, and 2 grams of protein. Pure oats, rice syrup, expeller pressed canola oil, brown sugar, organic crisp brown rice (organic brown rice, organic brown rice syrup, sea salt), natural vanilla flavor. 1 apple cinnamon granola bar is 130 calories, 5 grams of fat, 19 carbohydrates, 2 grams of fiber, 5 grams of sugar and 2 grams of protein. Pure oats, rice syrup, expeller pressed canola oil, organic crisp brown rice (organic brown rice, organic brown rice syrup, sea salt), dried apples, brown sugar, organic cinnamon. Goji, Elderberry, Acai and Pomegranate- these 4 types of berries have quite the buzz in the health department, for all the nutritional benefits that they provide. 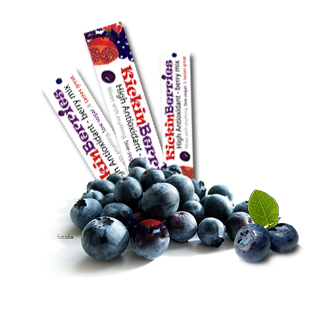 Well, the folks at easydrinkpack.com sent me 2 free samples from of the KickinBerries Antioxidant Drink Mix, that combines all of these nutritious berries. (Read more about the health benefits of berries on their website) Their motto is “You bring the bottle, we’ll bring the benefits”. I’m always on the lookout for yummy alternatives to water, but ones that are healthy and also provide health benefits. This seemed to fit the bill quite nicely! I poured it into my water and noticed it changed into a nice deep purple/pink color. I took a sip- not too shabby! It was mildly sweet with tart aftertastes. I did notice it made my throat feel a little “phlegmy”, but not too bad. Overall, I would give this product 3 1/2 stars. I love the fact that it provides a nutritional punch combining the 4 berries, and is actually refreshing. I didn’t like that one of the ingredients was sucralose, and that it’s 25 calories per pack. I don’t think the flavor is strong enough to split the pack in half and use it for 1 water bottle, so you would probably have to use the whole packet. However, 25 calories a packet is a LOT better than the 100+ you can consume with certain juices or soft drinks, so that’s definietely a healthier swap! 1 packet is 25 calories, 0 grams of fat, 9 carbohydrates, 0 grams of fiber, less than 1 gram of sugar, and 0 grams of protein. Acai, Elderberry, Pomegranate, Goji Proprietary Blend (1750 mg). Maltodextrin, Citric Acid, Berry Flavor, Vanilla Flavor, Silicone Dioxide, Sucralose. Kay’s Naturals is a brand that makes better alternatives to snacks, packed with nutritious protein and fiber for satiety. They make a whole assortment of snacks and cereals to please all, and they are mostly Gluten Free. I was sent some products to try from Kay’s Naturals, including the Protein Cereal in Apple Cinnamon and French Vanilla flavors to try. 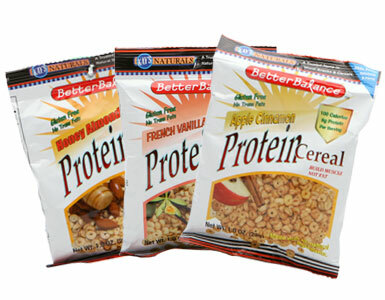 The cereals have no trans fats, are gluten free, and have 9 grams of protein per 100 calorie serving (1 oz of cereal). Each of the cereals are ring shapes and have a light and crunchy texture. Overall, these deserve 4 stars. You get a nice portion of cereal to munch on for only 100 calories, and you get 9 grams of protein per serving! Apple Cinnamon- Soy protein isolate, yellow corn flour, rice flour, tapioca starch, inulin, pea fiber, natural honey, evaporated cane juice, dehydrated apple pieces, canola oil, cinnamon powder, vanilla extract, natural flavoring, baking powder, double-acting leavening agents, salt. French Vanilla– Soy protein isolate, yellow corn flour, rice flour, tapioca starch, inulin, pea fiber, natural honey, evaporated cane juice, canola oil, cinnamon powder, vanilla extract, natural flavoring, baking powder, double-acting leavening agents, salt.